The Logitrans SELF Maxi Stacker is a heavy duty stacker with electric lift, electric propulsion and an adjustable carriage. Various attachments can be exchanged for the forks such as drum handlers, drum rotators, reel booms, lifting jibs, platforms and any customers specified bespoke attachment. The SELF Maxi Stacker is also available with straddle legs which is model SELFS Maxi. 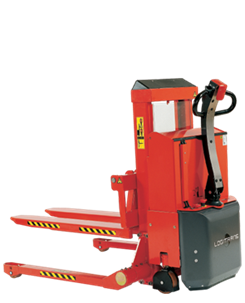 The SELF Maxi Stacker is available in various lift heights from 890mm to 3270mm.